OnePlus has started rolling out a new open beta update to its OnePlus 5 and 5T smartphones. Arriving as Open Beta 25 and 23, respectively, the update brings along a bucket full of changes, including caller identification functionality for Indian OnePlus 5 and 5T units and January security patch. 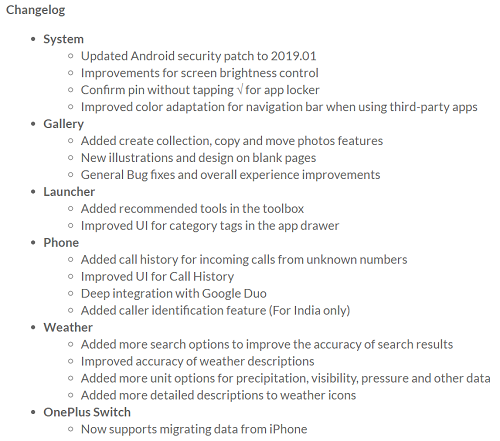 The update also includes improvements related to screen brightness control, Call History UI, UI for category tags in the app drawer, and weather descriptions accuracy. Color adaptation for navigation bar when using third-party apps has also been improved. New additions include create collection, copy and move photos features, recommended tools in the toolbox, call history for incoming calls from unknown numbers, more search options to improve the accuracy of search results, more unit options for precipitation, visibility, pressure and other data, and more detailed descriptions to weather icons. Moving on, with the update, now you can confirm pin without tapping √ for app locker. Then there are new illustrations and design on blank pages in Gallery. The Phone app now features deep integration with Google Duo, and the OnePlus Switch app now supports supports migrating data from iPhone. 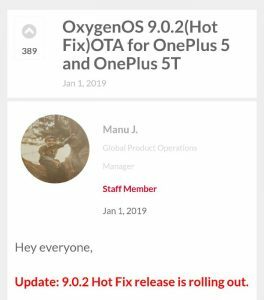 Recently, the devices also received a stable update which arrived as OxygenOS 9.0.2. It brought along a WiFi-related hotfix. Basically, after 9.0.1, users started reporting WiFi connectivity issues with certain third party apps, so this hotfix was aimed to resolve that problem. Rest of the change log, as you can see in the image below, was same as that of 9.0.1. Coming back to the beta update, given that the update has just started rolling out, it may take time for the notification to pop up on your device. So you need to wait for your turn or grab the packages from the links posted below. Once you are able to install though, let us know your experience with this new beta in the comments section below.